FORT LEE, Va. — Community members are invited to a Women’s History Month observance set for March 21, 11:30 a.m., at the Lee Theater. Retired Lt. Gen. Kathleen M. Ga iney, former deputy commander, U.S. Transportation Command, Scott Air Force Base, Ill., will be the guest speaker. The 2019 national theme for the observance is “Visionary Women: Champions of Peace and Nonviolence.” The hosts of the Lee program are CASCOM and the 23rd Ordnance Brigade. The 392nd Army Band will perform. Gainey retired in 2013 after completing over 35 years of service. Her active-duty career started in 1978 when she graduated from the ROTC program at Old Dominion University and received a bachelor of science degree in special education. The Army Sustainment officer’s resume of top assignments includes command of the 5th Heavy Boat Company, Ford Island, Hawaii; 6th Transportation Battalion, Joint Base Langley-Eustis; 7th Corps Support Group, Bamberg, Germany; Defense Distribution Center, New Cumberland, Pa.; and commanding general, Surface Deployment and Distribution Command, headquartered at Scott Air Force Base. 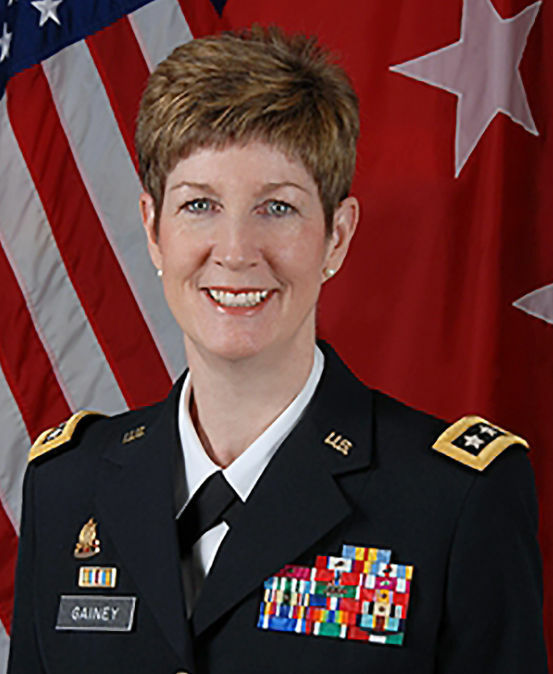 In addition, Gainey served in the following capacities: chief, Container Freight Branch, Military Ocean Terminal Bay Area, Oakland, Calif.; program analyst, U.S. Armament, Munitions and Chemical Command, Rock Island, Ill.; executive officer, 2nd Area Support Group, 22nd Support Command; S-2/S3, 702nd Transportation Battalion, Saudi Arabia; Division Transportation Officer, 24th Infantry Division (Mechanized), Fort Stewart, Ga.; and special assistant to the Army Chief of Staff, Washington, D.C. Following her military career, Gainey moved to Arlington with her husband, retired Brig. Gen. Edward Donnely and became senior vice president for logistics, Cypress International. The couple now lives in Ashville, N.C. The month-long national celebration honors women who have shaped America’s history and its future through public service and government leadership. WHM is an off-shoot of International Working Women’s Day that started in 1911. The first Women’s History Month took place in 1987. The Fort Lee observance is open to the public.